This has totally been a long overdue post! I’ve been wanting to share what I know with y’all and have been going back and forth about what I should share. One of my goals this year is to share more insightful topics on our Small Business School blog series so if you guys have any burning questions, please leave a comment at the bottom and let me know! There’s so much that goes into creating a product line that would warrant a MUCH longer post and perhaps even multiple posts. I wanted to just give y’all a summary and things I’ve personally identified as the most important things to consider. Whether you are thinking about starting your own stationery line or perhaps just want to expand on your product offerings, these are 8 of the most important things to consider. Identify what product or product range you want to offer. Specifically for a stationery or paper line, I feel like product variety is important. It’s something I look for when deciding to add a new stationery line to our shop. Having some diversity is easier as a buyer to purchase a group of product that will also merchandise really well together. When deciding on product for the P+CP line, I wanted to hone in on products to fill the gaps. There are a lot of great paper businesses out there with great product, however, there were still product gaps in what I felt I wanted in the shop. I also wanted to have this new product line be cohesive and easy for paper lovers to gravitate towards multiple items. I also did a poll via social media to ask our community what they wanted. Simple questions like asking if they’d prefer a notepad that was lined or blank was incredibly helpful! Trust your gut with the design + creative process. There are no shortage of ideas that are floating around my head. And I want to turn them all into tangible goods- but that’s not realistic because producing product takes an upfront investment. I knew I wanted our P+CP mint color to be present throughout our designs and our line, even as it evolves. I also wanted to have designs that were “timeless”. Trends are a real part of life and design, but I wanted to stay true to what felt in alignment with our business and brand regardless of if it was cool or not. An example would be suddenly incorporating the Pantone Color of the Year into everything even if it doesn’t fit our brand. Functionality and simplicity was another thing I focused on. I also ask myself every time I design or want to release a new product “Would I use this?”. I probably have twice as many designs that were weeded out slowly before deciding on our current line! Be resourceful-Google will be your bestfriend. I did most of my test printing at home and did a TON of googling. I already had some sources from before the P+CP existed and I was working on my own line full time. I visited several local print shops to get quotes from them. There is no one “size” fits all for any business. What works for someone may not work for you and vice versa. It’s up to you to explore and do some research. This might be something that’s only true for me, but even though I have a lot of friends in the industry- I don’t usually ask them for their printers or sources. Mostly because I see it as asking someone to give me all their research and hard work for nothing. It takes months, sometimes even years for people to find the right printer/manufacturer and it seems like a big ask to have someone just hand that to me for nothing. I equate it to going into your favorite restaurant and asking the chef for their recipe. *p.s. this was one of the most asked questions when we opened up questions about producing a product on our Instagram community! Always get a sample and proof! I always order samples and pay for proofs. It sometimes costs a little more but it’s worth it to know you’re not going to end up with a giant box of product with a slight imperfection or a missed crop line. This actually happened to me during the production of our line last year. I ordered a proof and yet, still somehow missed that I did not remove the crop lines off one of our notepads. It was 100% on me for missing that and now we have a big box of notepads we use for scrap paper because there’s just the tiniest lines down each side. It’s barely noticeable but as someone who really stands for quality of paper (and business in general) these will never be sold! It definitely stung both in my bank account and I had to take a moment to realize I’m human too and mistakes will happen! Calculate the cost of each item and then factor in the total cost. A lot of times, the larger your quantity is the lower you’re going to be able to get the cost per item. That means higher profit margins! But if you are just starting out, I really think doing as much printing (by investing in a good and solid printer) can help you from just having way too much inventory on hand of just one thing. If you are trying out a ton of designs, you will be able to do that without high minimums when you print yourself. If you want to outsource printing and production, you may have to streamline and only produce a few things at a time because of costs. Minimums can range from the hundreds to thousands! So even if you can get an item at a low cost per item (example $4) having to order hundreds or thousands of that means you’d have to pay all of that upfront! A big thing to consider and NEVER forget is to include the TOTAL cost of each item into what you price it at. Take into account the cost you pay for shipping for the product to be sent to you (if you are outsourcing your production), cost for packaging (yes even the cute little labels and stickers on your product) and even the cost of you designing the product/packaging design! Price for wholesale and price competitively. When pricing your product, always price for wholesale pricing even if you are not planning on wholesaling right now (or ever!) For example: If you plan on retailing a greeting card at $5. You will probably be wholesaling it at $2.50. So to make a profit, the total cost of that card should be at or less than $1.25. I also think it’s really important to price whatever it is you’re making competitively. In my opinion, I want people to pick up our product because they like it vs. choosing it because it’s a cheaper option. Get comfortable with vulnerability and be open to feedback. Putting your art, design and work out into the world is both exciting and terrifying at the same time. You’ll question if people like what you are doing. You’ll question if you’re good enough. You’ll also probably start comparing yourself to others. A huge thing is knowing that the people who will resonate with what you’ve created will LOVE it, and knowing that you’re not going to be for everyone and that’s okay too! Once you create your product(s), it’s important to get feedback and be open to hearing what people have to say about your work. Get your product out in front of people at local events and listen to what people say when they see or touch your product. There’s no better way to test the market and see what designs or product resonates with your audience than for you to do that. Last but not least, perhaps the most important thing is to start small. Start with a small range of offerings, with a few designs. Print from home to keep your cost down and to keep from ending up with thousands of the same notepad stored in your closet! You’ll be able to offer diverse offering while being able to test out various designs and products. Invest in local markets and shows to test your products- make tweaks after feedback and be open to evolving. What questions do you need to ask printers/manufacturers? Do you need a lot of followers before you launch? Are countdowns good a good idea? Alright, here’s the inside scoop and you’re hearing it FIRST! We’re going to be releasing NEW product in a few weeks. Like even more stationery and paper goodness. So get excited!!! Valentine’s is just around the corner, but if we’re being real here, we’re all about GALENTINE’S! Not like we need an excuse to celebrate our favorites and girl crushes, but we wanted to take the time to share about five of our favorite women in business. All of them own and run their small businesses with the talent and tenacity we hope we can someday achieve. These may or may not be women you already follow or know, but y’all the world of small business ownership can be lonely and hard when you feel like you’re in it alone. And these wonderful women make this whole journey so fun and magical. Because even on the hard days, it’s inspiring to look to them and be reminded that it’s so worth it. We’re still sad Miranda moved away from Austin, but we’re so happy she visits us multiple times a year. She’s our Shibori Indigo queen instructor and one of our favorite creatives of all time. She launched her print shop where she shares her amazing photography from her travels and adventures. She also started her podcast and let’s just say, we look forward to the new episode each week on Thursdays! We met Noel IRL at the Stationery Show and both laughed about how it felt like we’ve known each other considering we’re Instagram friends :) She’s got the keenest eye on stationery and paper trends. Her feed is to die for- if you’re ever needing something to brighten your day, go take a scroll. She also opened up a event, photography and workshop community space in DC called The Common Room and you bet we’re hoping we can one day share some P+CP workshop magic in her space! We first met Jules when she (and her now fiance and CUTE pup Luna) popped in our old 6th street studio. We immediately adored her energy and bonded over our love of plants. They were just visiting Austin but dropped some hints they would be moving to Austin soon- and boy are we glad they did. Jules radiates. Period- it’s hard to describe unless you’ve had a chance to meet her. She shares so much valuable information through her blog as well as her Instagram. In a sea of oversharing and bloggers pushing an agenda, we know that what Jules shares is truly what she believes in. We’re so proud of her new guide book to Simplify & Thrive and we think you’d love it too! We’ve been CRUSHING on Meg and Belle & Union way before we even opened up our shop. And not to be cheesy about it, but we’re still swooning over how lucky we are to call her a friend (like we’re texting friends now!) Her attention to detail with her design, coupled with her letterpress technique makes Belle & Union stand out in a very full stationery world. Meg’s commitment to USA made and quality is something every small business should aspire to. Belle & Union also has a brick + mortar in San Antonio (anyone wanna road trip?) and y’all, it’s BEAUTIFUL. She also hosts some workshops and we’re particularly eyeing on one of her letterpress classes in the future! Chelsea makes us wish that California was our neighboring state- that way we could see her all the time :) We met this talented gal via the world of social media and instantly fell in love with her art work (and her!) We finally got to meet in real life at last year’s National Stationery Show and meeting her in person just confirmed that she truly is just as warm and fun as the beautiful art and stationery she creates. She painted a new calendar for 2019 featuring Tiny Plant Ladies. And we just about had a heart attack when we saw a sneak peek that she was painting Pei as one of her Tiny Plant Ladies. Who says kids should have all the fun with cute little valentine’s day notes? Surprise your friends and co-workers with the cutest little valentine’s mini prints that’ll leave them feeling loved and adored! With a few simple supplies, you’ll be able to whip up your own secret messages for your friends to discover. Deliver them alongside a sweet treat or their favorite stationery for a handmade and fun touch this Valentine’s Day! Put your paper into an envelope, tie it up with twine and include a mini watercolor set. We like to include a little note that tells them it’s a secret message inside and to use the watercolor paint to uncover it! Your recipient can use the mini watercolor set or their own painting supplies to uncover your secret message! We shared this D.I.Y. in addition to a couple of other fun valentine’s on TV last week! Watch our D.I.Y. segment on Studio 512 here! Who will you be sending your valentines to this year? Staring the year off right means so many things, mindset, picking a word, setting new goals… the list can go on! Sometimes, setting yourself up for success is as simple as having the right tools at your fingertips- in this case, the right stationery! Having something to write with is the key to getting all of those ideas that pop into your head, down on paper! Come by our shop and test out our amazing collection of pens and find your favorite. 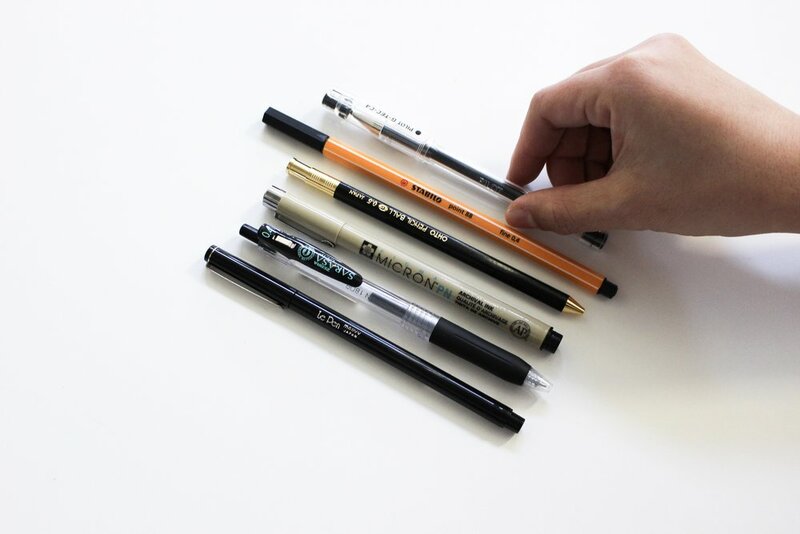 We think everyone should have their go-to black ink pen! Whether you are weekly or monthly overview kind of person, there’s nothing quite like being able to look over what you have coming up at a glance. Having it all in one place to serve as a visual reminder is an incredible way to spread out all your to-dos and meetings so you don’t get overwhelmed. We also think weekly notepads are a great way to track your to-dos! We can all agree that snail mail just makes every day better. Taking the time to write a thoughtful thank you note or just sending someone something just because can help spread a little more kindness out into the world. 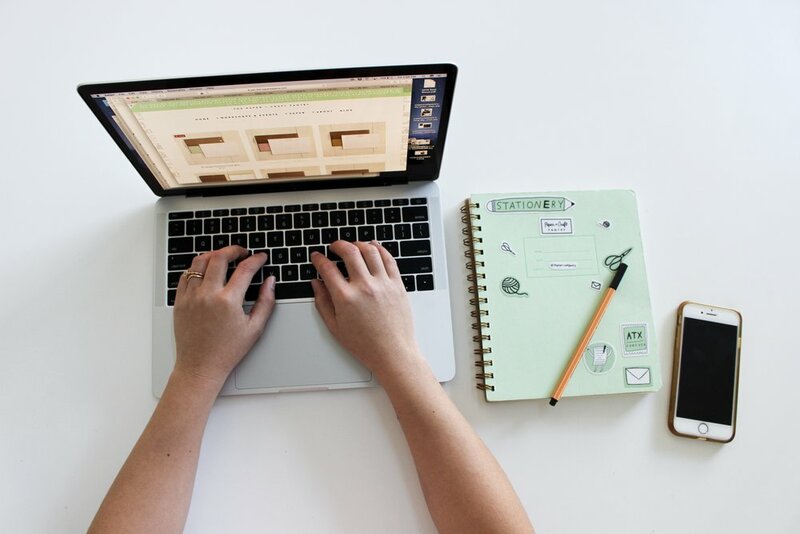 Taking the time to have systems in place, organization tools at your finger tips and things that will help you stay motivated and on task may be the key(s) to work days that just flow. What are some of your favorite tools and stationery to stay focused and intentional today, and every day? Tell us more in the comments below! A new year brings a fresh start and there’s something just magical about it don’t you think? Over the past few years, I’ve been working on finding ways to improve the flow of my days and work weeks and I just couldn’t pass up a chance to share with you guys. It’s easy to feel motivated and feel that new year “high” but these 7 tips have helped me stay productive and motivated not only for the new year, but for the remaining 11 months of the year. It’s easy to feel overwhelmed when you feel like you have too much to do or when you don’t know where to begin. I try to start my week out by writing down EVERYTHING I need to get done during that week. I’ll look over my schedule and give every task on that large list a specific day so it spaces things out and breaks things up. I also am a big stickler to picking 5 things. Actually only picking 5 single things on my list to tackle each day where I’m not allowed to work on anything else on the list besides those 5 first. This really lets me prioritize what’s really urgent or important. It’s something I encourage our studio assistants to do when they come into work for the day- that way they can stay focused and flow into how the day goes at the shop. When you’re feeling distracted, instead of forcing the work- lean into the flow and take a break. I really think it may seem counterintuitive to stop working when you’re busy or feel like there’s a lot to do but taking a short break- even if it’s just 10 mins can really help you reset and refocus. I’m a fan of of going outside for some fresh air, a quick walk around the block or to check the mail, sometimes I’ll even use it as an opportunity to grab a glass of water to rehydrate or even sit up against the wall to do legs up the wall. What I’m about to say may upset some people… but I really feel like meetings are a waste of time. At least they can be. I do understand the importance of a meeting and know that from time to time it’s important- but filling your days with meetings can actually be a waste of time as you have to constantly switch gears between meetings that takes up valuable time in your day vs. just getting things done! I try to only schedule a handful of meetings a week- and only when they’re necessary! And when I do have a meeting, I have a really clear agenda to move through so it’s actually a meaningful time spent. I actually do this regularly- I set a timer for 30 mins- an hour or even two hours and leave my phone out of sight. That way I can really dive into what I need to work on and focus on it- I know that when my phone alarm goes off, time’s up! Tell a friend what you are working on- someone who can check in with you. I really believe in sharing what you are working on with someone you work with, or someone who can hold you to what you say you’re going to do. Someone who asks you how your project is going- and I think the simple act of declaring what you are doing outloud allows you to hold yourself accountable. I am so guilty of this, when I feel like there’s a lot going on in my life or on my plate it tends to reflect the state of my desk in the office. Aka, it’s like a tornado blew through my office when I have a ton going on. To start each day, I take a few minutes to go through what’s on my desk so I can literally make space for myself and my work. Clear desk, clear mind! Don’t check your email every 5 minutes. 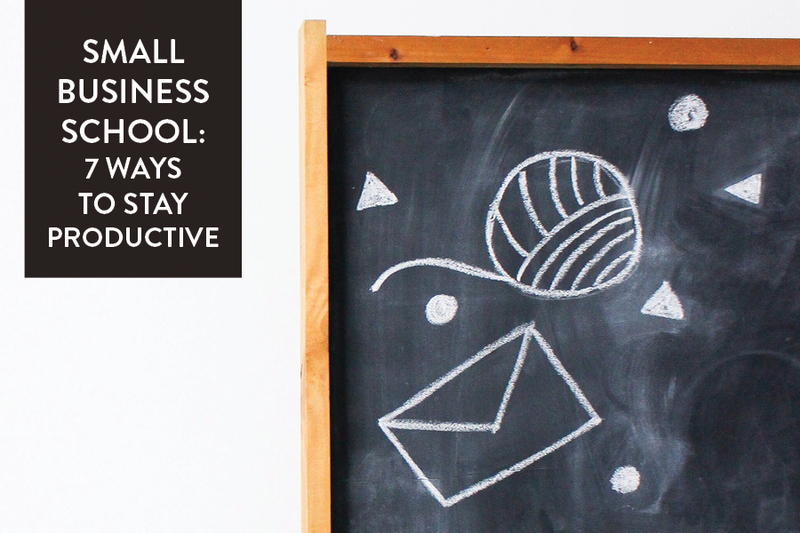 Set aside a few times a day to check and respond to emails. I know a lot of people who block their emails into chunks based on the time of the day- that way you’re not spending a few minutes here and there to go through your inbox but can dedicate a solid part of your day to it and dedicate the rest of the time to work! We’ve had a nice little break and we hope you guys had a wonderful holiday break as well. As we gear up for our second week back in the shop, we’ve got our heads full of inspiration and fun ideas for the shop + studio. And if we’re being honest, the overwhelming feeling of possibility also comes with a little bit of just feeling plain overwhelmed! If you’re nodding your head as you are reading this, you’re going to agree that setting monthly intentions can work wonders. These little reminder nuggets can be so helpful and a great way for you to track your progress month to month, to direct you back to your “why” and to re-inspire you if you’re feeling like you’re in a rut. 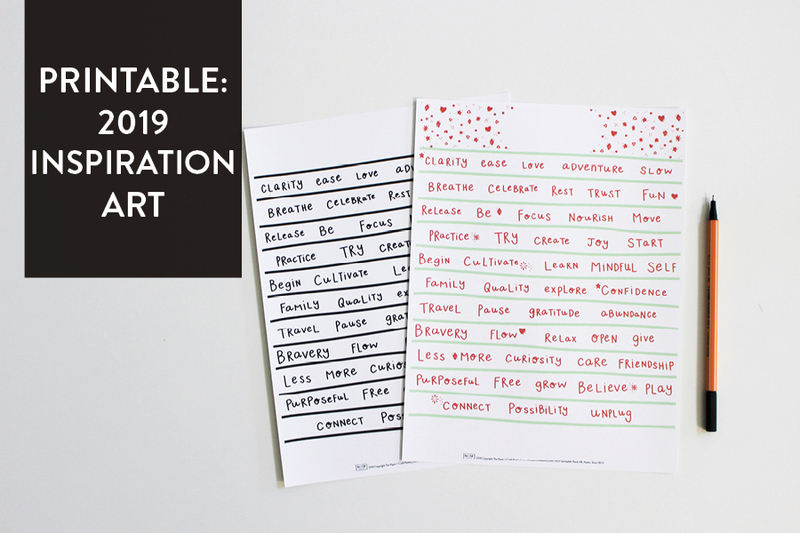 We designed these monthly printables as a simple way for you to carve out time at the beginning of each month to re-set. To take each new month as an opportunity to start over, move in a different direction, at a different pace- whatever it is that makes you feel like you’re flowing through 2019. 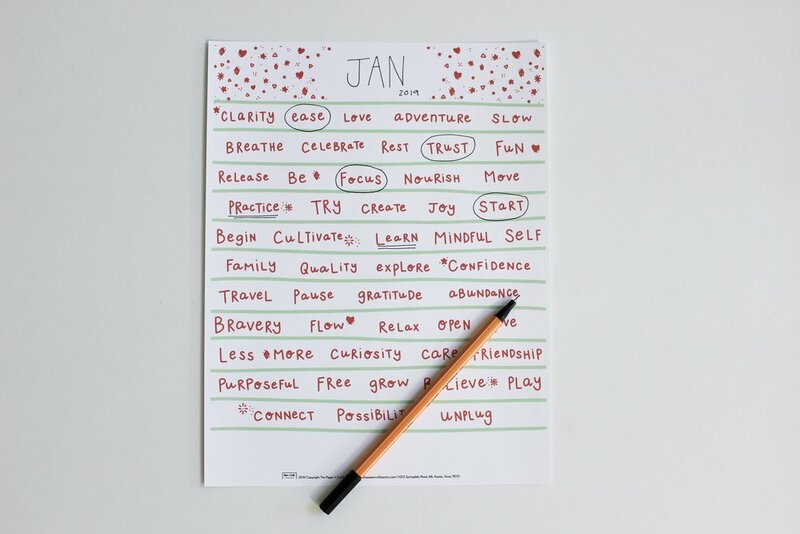 Print one out at the start of each month, take the time to circle all the words that align with you- we’ve even left room at the bottom for you to add your own spin to this. You can add a word that isn’t on the print, leave a little note to yourself. And we created two versions- one incorporating our favorite mint color along with Pantone’s color of the year “Living Coral” as well as a minimal, black and white one that happens to look gorgeous printed on Kraft paper! Print out one for each month. Set aside time to unplug and root down into your intentions.